It’s the one year publication anniversary of my novella Descriptions of Heaven. In celebration, I’m holding a CRAYON COLORING CONTEST. First, I want to say that the journey from conception all the way to this anniversary has been amazing and harrowing, wonderful and weird, and I want to thank everyone who helped me along the way. Thanks goes to my proofreaders who gave Descriptions of Heaven their time and attention back before they could ever have known that anything more than a dream of a book would come from those papers they readily red-penned. Thanks to all those reviewers who took the time to read an advance copy of my book; I know you all could have said no and picked something else to review. And thanks to everyone who has bought and read a copy of my book. 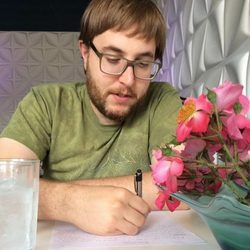 You could easily have put your cash toward something else, so thank you thank you thank you for taking a chance on this practically unknown author and spending a little time with his words. CRAYON COLORING CONTEST: As anyone who has read the book probably remembers, there’s two scenes where Robert and Natalia’s son, Jesse, uses crayons to color a picture of Billy, the lake monster. For this contest, I want you (or your child!) to send in one full color crayon drawing of the lake monster from Descriptions of Heaven. Deadline is Christmas day. My wife and I will pick the winner. If you are selected the winner, you’ll get your design on a t-shirt and we’ll also send you a copy of the novella along with the t-shirt (we’ll need your address and shirt size only after you win, FYI). Additional copies of the shirt will be available to purchase online. So go get yourself some crayons and get to drawing. If you’re not sure what to draw because you haven’t read Descriptions of Heaven yet, you can find it on Kindle, a paperback on Amazon, online at Barnes & Noble, or on the publisher’s website. You can also order it from your favorite local bookstore. Materials: Crayon drawings only accepted (a graphite pencil can be used for outlining purposes). No markers, colored pencil, paints, or digital manipulations please. Deadline: Latest entries will be accepted Christmas day, ending 11:59 p.m. Pacific Standard Time. Restrictions: Contest is open to anyone of any age. If under the age of 13, please seek permission or assistance from a parent or guardian. There are no country or nationality restrictions. Prize: Winner’s prizes are 1) their crayon drawing used on an official t-shirt 2) a free t-shirt in the size they specify and 3) a copy of Descriptions of Heaven. Entrant agrees to these rules and the full Terms and Conditions here. Entrant agrees that they (or their child or the child to whom they are a guardian of) created the artwork submitted as their entry. Entrant winner agrees that Randal Eldon Greene and/or his Brand have full rights and ownership of submitted material. Entrant agrees that by submitting to this contest, if they are selected the winner, compensation for use of the artwork will only be in the form of the prize as listed above and no cash alternative or further prizes or payments will be given. If selected the winner, entrant agrees to respond within one week to a notification message sent to their Facebook profile or at an email address or to a comment on their contest entry. Winners will be announced within three weeks of the contest end date.